AEJuice › Support › General › Where do I find my purchase code? This instruction applies ONLY to purchases from videohive.net. Purchases from aejuice.com do NOT need a purchase code. Please see this article on how to activate your product. 1. Open the Downloads page (click here). 2. Click the ‘Download’ button. 3. 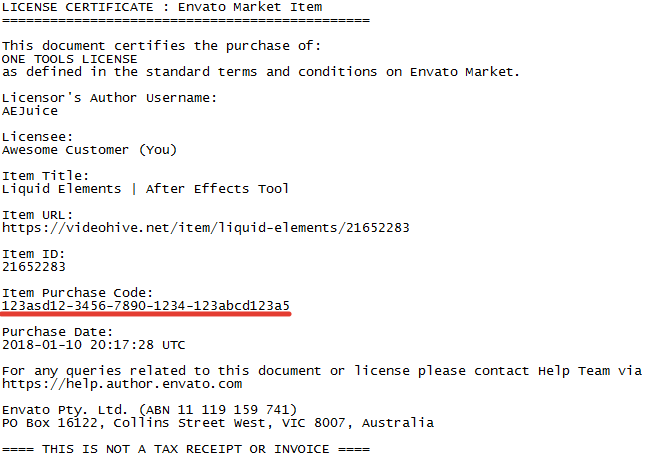 Select ‘License certificate and purchase code (text)’. 4. Open the downloaded file and copy the key from the ‘Item Purchase Code’.